- Optional surface color: Satin colors. . . . . .
- It can be fixed to a sun-umbrella or any other similar object. 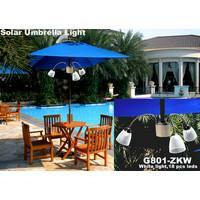 - It can be fixed to all sorts of sun-umbrella or garden umbrella with the umbrella pole diameter of 25~40mm. - With simple structure for easy installation and dismantling. - Photocell included, switches on automatically at dusk. - Manual ON / OFF switch included, ensures you can turn it off at night when desired. - Lightening time at night: 4-6 hours after fully charged in daytime under sunshine. - With excellent battery overcharge protection and discharged control system. - Quality Guarantee: 1 year. - Quality Approval: CE, RoHS.